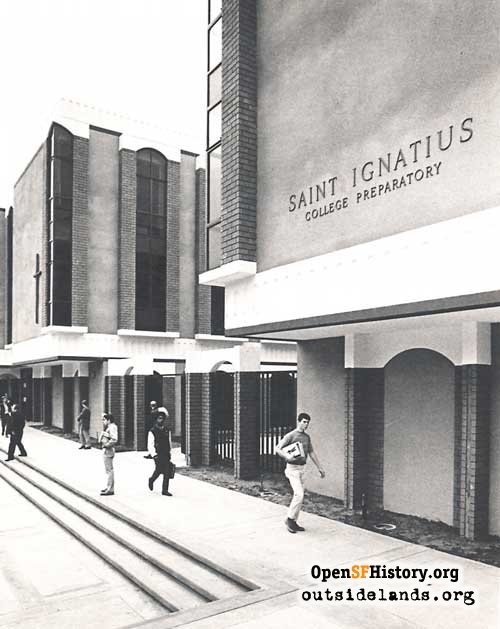 Frank Dunnigan tells of St. Ignatius High School's move to the Sunset, and some student high jinks too. 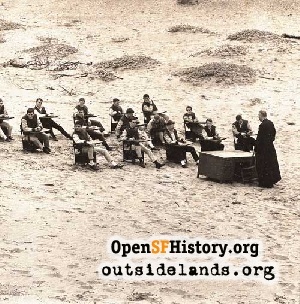 There was a time, not all that long ago, when sand dunes still covered most of the Outside Lands. Even today, I can recall the massive expanse of sand that once covered the corner of 17th Avenue & Vicente Street where St. Cecilia's Church now stands. There was an even bigger area at the Sunset Reservoir near my grandmother's house on 21st Avenue near Quintara, plus any number of corner lots on Taraval, Vicente, and Noriega, from 19th Avenue all the way out to the beach. But the biggest sand dune that I remember, and the one that had the biggest impact on my life stretched from 37th Avenue to 39th Avenue, and from Pacheco to Rivera. 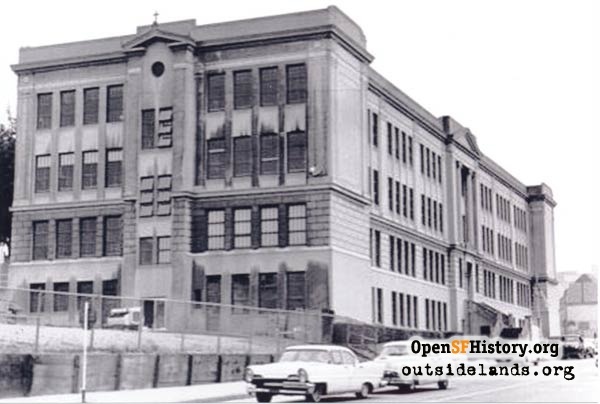 St. Ignatius High School building, Stanyan Street, 1960s. - Courtesy of St. Ignatius College Preparatory. Exactly 40 years ago, the buildings that were being erected upon that site were nearing completion, and the entire complex had been granted the inspiring futuristic address of "2001-37th Avenue" by the U.S. Post Office. Thus, a new chapter in the history of San Francisco came into being as the Sunset campus of St. Ignatius College Preparatory (the name had been recently adopted at that time to replace the old "High School" designation) opened its doors for the first time at the end of August 1969. Think back—Neil Armstrong was the first man to walk upon the moon just a month earlier, while at the same time, a small wooden bridge in a place called Chappaquiddick was making the news. There had just been a summer rock music concert in upstate New York—Woodstock, they called it. (Reality-check here for those who do not keep track of such things: the late Mary Jo Kopechne—along with the majority of those concert-goers—would now all be old enough for Social Security!) San Francisco's MUNI changed its colors from green and cream to maroon and gold, and purchased its first new bus in over two decades that summer. Neil Diamond was crooning Sweet Caroline, Creedence Clearwater Revival was banging out Bad Moon Rising and Lookin' Out My Back Door, and the Beatles were about to top the charts with Come Together on their Abbey Road album, several months before they came apart. It was against this backdrop 40 YEARS AGO that St. Ignatius made its move to the Sunset District. 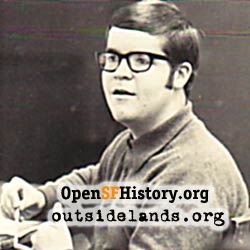 Having spent three years on Stanyan Street (and part of a long legacy of selling candy bars and raffle tickets faithfully, year after year since the early 1960s, in the hope of possibly attending a new Sunset campus some day), it came as a bit of a shock when the announcement came in late 1968 that the "new school" would be ready for occupancy by August of 1969—the start of my senior year. As the days of spring ticked away, it seemed almost unreal that Stanyan Street would no longer be the daily meeting place for the 1,000 or so of us who called ourselves Wildcats. Very soon, indeed, the distance from home to school would be shortened for a great many S.I. 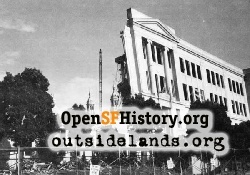 students—indeed, in those days, nearly two-thirds of the student body lived in the Outside Lands. Ironically, those of us who were around back then still refer to the 37th Avenue Campus as "the new school," even though that Sunset campus is now OLDER than Stanyan Street was at the time we left there in June of 1969. The author as a St. Ignatius student in 1969. - Courtesy of Frank Dunnigan. The planned departure from Stanyan Street was tough on everyone. Many of us were the second generation in our families to have sat in the same seats, in the same classrooms, with the same lectures about things like Latin verb endings and the Entente Cordiale between England and France at the time of World War I. Things were even tougher on the physical plant, though, as many students quickly became souvenir hunters, and integral parts of the structure began disappearing—everything from drinking fountains and the old-fashioned double-sided clocks that protruded from the hallway walls, to locker doors, pendant light fixtures—even the Stanyan-McAllister street sign disappeared and wound up in my friend John's basement on Everglade Drive, where it remained for several years. S.I. 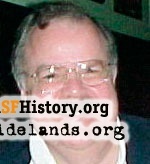 's Principal, Father Edward McFadden, told the student body in no uncertain terms, that since the building had been sold to the University of San Francisco for additional classroom space, there was an expectation that it would be delivered reasonably intact, and not be stripped piecemeal by S.I. students. The souvenir hunters were slowed, but not stopped in the pursuits, and fixtures continued to disappear, albeit at a slower pace. Now that the pesky statute of limitations has expired, I can relate any number of other stories that have not been widely discussed until now. 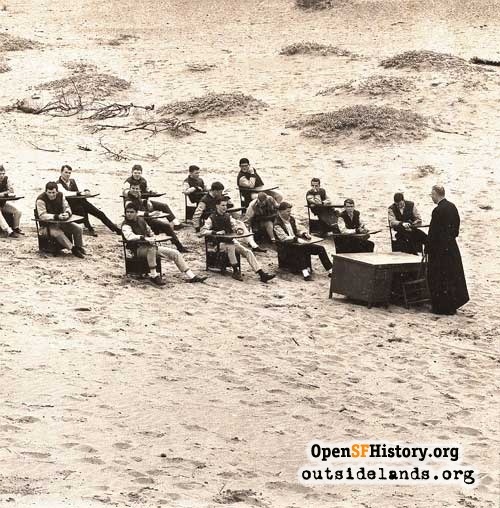 Publicity photo from 1965 heralding St. Ignatius High School's plans to move to the sands of the Sunset District. - Courtesy of St. Ignatius College Preparatory. As the move began to get underway that summer, the school had decided to recruit student volunteers, in a cost-saving effort, to help load and unload the moving vans for the relocation. Not surprisingly, those conscripted student-volunteers found themselves handling everything from high-priced $50 physics textbooks from the bookstore to the personal stationery of the school's President, Father Harry V. Carlin, S.J. So, although there was a severe shortage of certain volumes in the campus bookstore that fall, all those students who were involved in the moving efforts miraculously found themselves in possession of full sets of brand new textbooks as the 1969 school year began. The first day of school arrived, and we made the drive to 37th Avenue following Mass at St. Ignatius Church at Fulton & Parker, in time for the actual dedication ceremonies. I was riding that day along with my fellow yearbook staffers, Keith & Larry—sadly, now both gone for many years—in Larry's little 1963 red Chevy Nova, zipping through the back roads of Golden Gate Park, as we were planning the photos that we would need to include in the opening pages of the 1970 Ignatian. Keith was the editor, an extremely bright young man, whose ideas and perspective were captured beautifully in a series of close-ups, fish-eye lens shots, and other special effects that he recorded himself. I was his assistant, or as he referred to me in Italian, soldati—the faithful spear-carrying foot soldier who kept check-list after check-list, making sure that we were always on schedule and getting the pages sent off to the American Yearbook Company in Visalia, California by each appointed deadline. Larry, a Junior, was the photographer who was supposed to hang on the sidelines of every game, dance, play, and musical presentation, recording the action shots that defined the era. "Try not to get too many people with their hands on their hips, squinting into the sun," Keith warned, saying that every "dedication of the new school" photo, going back to the 1850s shots in two locations on Market Street, 1880 photos on Van Ness Avenue, 1906 images on Hayes Street, and 1929 views on Stanyan Street, all seemed to have people in that same stereotypical pose. As it turned out, Keith was granted his wish. Although Larry was snapping away, roll after roll, a freak darkroom accident involving a mis-marked light switch wiped out the entire collection of those dedication ceremonies. Instead, Keith and I remained behind late one afternoon, just before our first deadline, moving construction equipment out of range, posing classmates, and photographing strategic angle shots on 37th Avenue that gave the appearance of a completed campus. Those shots ended up being some of the best in the entire book. Initially, only the classroom building and the faculty residence were ready for use that fall. As we moved from class to class, the newly carpeted hallways and the resultant static electricity were quite a change from the noisy, echoing atmosphere that had been left behind on Stanyan Street. No one said so at the time, but the new building also included updated safety features, and a silent realization that the old school was truly a rundown firetrap with exposed interior stairs, glass transoms, and combustible wall and floor surfaces that would have spread a fire through the basement and three upper stories in a matter of seconds, not unlike the disastrous Chicago elementary school fire of 1958 that had taken hundreds of young lives. St. Ignatius College Preparatory's new campus, 1970. - Courtesy of St. Ignatius College Preparatory. Owing to the lack of completed campus facilities (no library, cafeteria, gym, or theater) for almost all of the 1969-70 school year, we had an abbreviated schedule that ran six periods from 8:10 in the morning to 1:20 in the afternoon, with no lunch period. It was a mixed blessing, really—all of us had always hoped to attend the "new school," but it just didn't feel the way that S.I. should feel. All the touchstones were gone, and with no lunch period for anyone, the notion of a senior-exclusive, off-campus lunch was a perk that evaporated into the salt-scented fog. Perhaps that's the reason why, to this day, the class of 1970 has been so closed-fisted when it comes to alumni financial support for the school—but that's another story entirely. 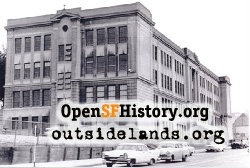 Without that lunch period, we quickly discovered neighborhood places like Herb's on Taraval, Big Daddy Hamburgers on Noriega near 20th Avenue, and the original Polly Ann Ice Cream on Noriega, out beyond Sunset Boulevard, and just a short walk from the new school. However, there was also a good source of food closer than many thought. The Jesuit residence had something that was known as a "Haustus Room"—a small area near the faculty dining room that had snacks, soda, milk, etc. freely available around-the-clock for the Jesuit community. It was acknowledged that students working the switchboard in the residence could have free access to the food, and that fall, a goodly number of seniors put in their daily five minutes "on the board," in order to avail themselves of lunch. Regular PBX staffers always seemed to be in the know about which teachers might be out sick the next day, which were planning pop quizzes in Spanish class, or who the worst performing students were in Trig & Analytic Geometry. To this day, one of my under-utilized talents is operating a PBX board, complete with all the cords and plugs and switches, and the ability to confirm ever-so-quietly that the caller had been property connected. The new campus also had a modern paging system in which green touch-tone telephones (which were then cutting-edge technology) were placed next to every regular phone in every single administrative area throughout all the new buildings. Users could punch in a three-digit code on the green telephones, and throughout the campus, a panel of colored lights, mounted conspicuously in every public area would flash a unique combination for the faculty member being paged. While this may have been what the architect and the planners wanted, it was clearly not in the best interest of those involved in Drama. Once the Little Theater opened in early 1970, the actors and their audiences were invariably distracted by the incessant flashing of the too-bright lights which were mounted adjacent to the stage just below the ceiling, and by the constant movement of faculty members out of their seats to get to a green phone to answer their pages. Saying nothing, but with a minimum of electrical tinkering, the offending signaling device in the theater was soon modified to flash only a dim, non-assigned combination of lights that would not bother the actors, nor cause anyone in the audience to get up and climb over others in the aisle to reach a telephone. Great success had been achieved in keeping the audience in their seats throughout every performance, thanks to a few students with some electrical know-how. 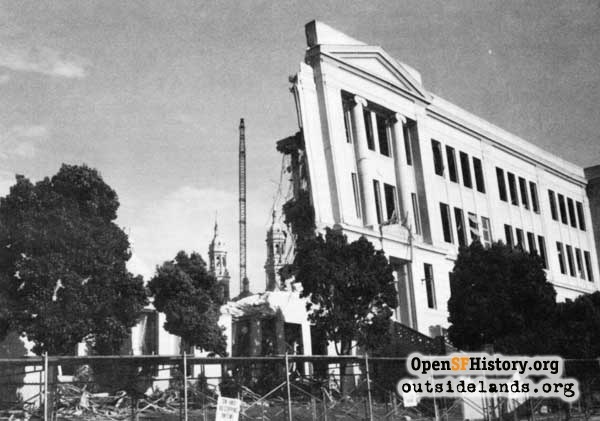 Demolition of the old St. Ignatius High School (then part of USF) on Stanyan Street, 1987. - Courtesy of St. Ignatius College Preparatory. The name of the first student to drink Regal Select in the new band room. It was once again the Physics students who pointed out that the sand dunes surrounding the new campus were perfect hiding places for various restricted beverages, the sand keeping the aluminum cans cool for several hours. The new elevator, with several of its special access keys in illicit circulation among the student body, was the best place to cut class—no one ever thought to check. The newly installed elevator was just "out of service" again. Muni's black & white student "car tickets" were being reproduced daily on the school's new state-of-the-art photocopiers, until Muni switched to red printing on a patterned gray background to thwart would-be counterfeiters. At the first school dance of 1969, held at St. Vincent DePaul's gym in the Marina due to the on-going construction on 37th Avenue, several teachers could not figure out why they felt so light-headed. Word was already out among the student body that the Assistant Principal's routine confiscation of cigarettes had accidentally picked up a couple of packs that contained more than just Marlboros—some student had marijuana cigarettes interspersed among the regular ciggies in the packs. Father Hyde was known to routinely toss the contraband packs into his bottom desk drawer, where it was understood that any faculty members who smoked could help themselves. That practice was soon ended. The fact that S.I. students had some amazing connections was demonstrated yet again in the spring of 1970. A friend of mine, driving his parents' car to the school one foggy night, in order to work on the yearbook, came out onto 37th Avenue at 11 p.m. to find that the late model Oldsmobile had been stolen. The police were no help, other than taking the required report and providing a copy for the parents' insurance company. Car theft in the Sunset was a fairly rare occurrence back then, and there were no clues about who might have been responsible. One enterprising classmate, fully aware of the recent hype surrounding a late 1969 LOOK magazine article alleging involvement between then-Mayor Alioto and the Mafia, discretely put out the word, through whatever connections that he may have had, that the stolen car belonged to a long-time city employee who worked closely with the Mayor at City Hall (true fact). The car turned up, unscathed—in fact, freshly washed and waxed—on Vicente Street in less than 24 hours, where it was spotted and driven home by my friend. The police, upon examining it, discovered that there was not a single fingerprint to be found anywhere on the vehicle. Case closed. As the year wore on, it came as quite a surprise to the Administration that several students—guys who had never done too well academically—were suddenly being accepted into some very prestigious colleges, in spite of iffy grades and relatively low test scores. Letters of recommendation, carefully typed onto some of that missing stationery from the desk of the school's President, carried far more weight in those days than such letters do now. Some of our sports rallies tested the patience of the local girls' Catholic high schools. One of the funniest of that year involved one of the male S.I. cheerleaders, the school's top soccer player, dressed in a St. Rose Academy uniform, with his "friend & classmate"—a vicious, nasty, barking German Shepherd, also dressed in the classic tan skirt, white blouse, and uniform jacket of St. Rose Academy. The young ladies across town on Pine Street and their Dominican nuns were not at all amused when the dog later came to an S.I. school dance, still in a St. Rose uniform, as someone's date, barking loudly and snapping at all the other guests, just like…well, you know. The yearbook staff was finally successful in managing to sneak in a picture of the annual "drink-up" on Golden Gate Park's Strawberry Hill, an event which the Administration always tried to both deny and suppress simultaneously. Rather than a blatant photo of beer-chugging seniors, the editors cleverly selected a silhouette shot of two students, arms outstretched, hailing the horizon of the future above the treetops. You have to look really, really closely to see the Olympia beer cans in their hands. In conclusion, I hasten to point out that this author was a mere bystander and observer to the preceding events, and was in no way personally involved (must maintain my tarnish-proof record of ZERO detentions in 4 years!). As for those whose antics precipitated these adventures, the author is equally quick to point out that the statute of limitations has run its course, and besides, the perpetrators are now all a bunch of old guys, certified senior citizens now approaching their 60s, who are far too old to be punished with detention or anything else. They are now S.I. 's financial benefactors, already the fathers of numerous S.I. grads, and soon to be the grandfathers of the school's upcoming crop of young men and women. Besides, they'll all deny every word of this, but the Shadow knows. Page launched 1 September 2009.